Thanks for the great files neolith! Here's the start of my "GBZ Woody" project First test cut of the front shell in a scrap piece of walnut, a double sided CNC operation. The outside turned out pretty good, but the inside will need some modifications. Probably have to enlarge some of the stand offs and button guides and maybe make the outer wall a little thicker. In the end, I'll be using a more dense piece of wood. Possibly some purpleheart or jatoba, etc. This is my first venture into a GBZ and I'm not quite sure what else I will need here or if I could maybe 3d print an insert instead of machining the inside parts. Just getting a start and learning/figuring it out as I go. I would be Very interested in a complete case if you deside on manufactoring this, And selling them. Whoa! @sw0rd that looks awesome! Thanks, we'll see how it goes and at some point, I'll start a proper build thread. Going to have to make some modifications to the inside. Will have to dig into the Fusion file and see what I can do. Not real adept with Fusion360 yet so it's not so easy going. Watching tutorials online is extremely helpful. Nice work on the case! I thought about making a wooden GBZ when I worked on the model, but couldn't manage to find a carpenter or a contractor with the right tools to create the shells for me without having to pay several hundred €. I am really glad to see that someone else succeeded! Going to have to make some modifications to the inside. Will have to dig into the Fusion file and see what I can do. Not real adept with Fusion360 yet so it's not so easy going. If you need any help with modifications for the model, just write me a mail and I'll see if I can help you. Thanks neolith, I might just take you up on that! I'm thinking of making the inside of the shells much more solid. For the inside of the front shell, I think that the area around the wells can be extruded up to the level of the top of the wells, leaving the standoffs the only part that is proud. The standoffs for mounting the board could be made larger in diameter for drilling and also to keep them from splitting from the screws. I was also thinking a surround that would position the screen in the right spot would be good. It also might be good to add just a little more to the wall thickness, as the lips are quite fragile. I'll work through what I can. Waiting on a few parts yet. How about a separate model for the cartridge? I could then 3D toolpath cut one of those out of a contrasting material and possibly even some text and or a simple logo. I see one on Thingiverse https://www.thingiverse.com/thing:2076431, not sure about fit though. Not sure about the battery cover yet, but maybe just use some magnets to keep it in place. These will be later on. Yeah, it's quite and involved operation to machine one. The outsides are best done as a 3D relief toolpath with a 1.5mm ball nose tool and the insides with a straight end mill. I did a 3D toolpath on the inside, and while it worked, it does take a long time for it to raster back and forth/up and down to complete it. At least a couple of hours for each face. A mostly 2d strategy would be better on the inside. 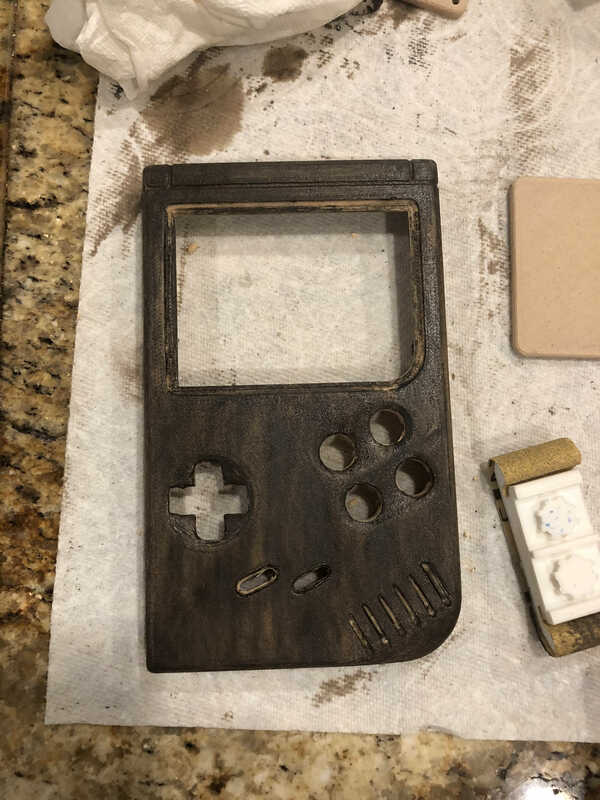 After that, then there's the sanding and finishing. By the time it's all said and done, they would be a bit pricey. There's a lot of optimization that could be done for the toolpaths, but need to get other things worked out first. To bad they don't make walnut, mahogany, maple, cherry, etc. colored wood pla! I'm working on the 3rd proto of the front half. Pretty slow going with available time and editing the file without breaking other parts of it. I've made it thicker on the inside face, a well for the LCD, and sturdier stand offs to be able to screw the board down.